Hello and happy summer! 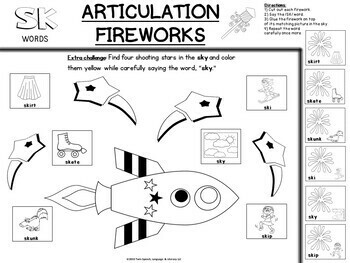 We are blasting off to another holiday themed speech therapy themed week with 4th of July activities! 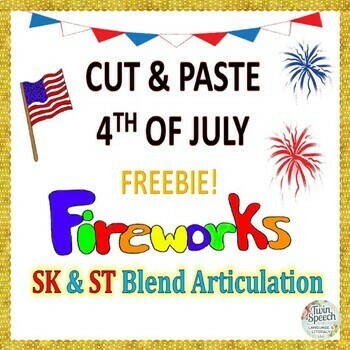 This is a fun holiday to celebrate so we took the items of fireworks and flags and put them together for this /SK/ and /ST/ blends articulation freebie for you to use in your own fun speech sessions. The worksheets are targeting two /S/ blends while targeting fine motor skills too because they require cutting and pasting. The pictures could be colored in too. It's these type of "move while we work" worksheets that our students just love to complete! 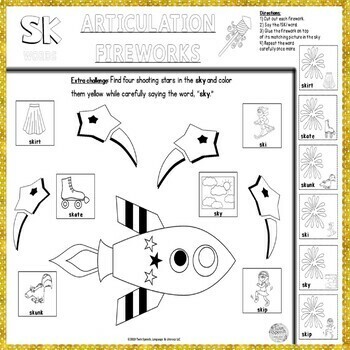 Students are asked to cut out a firework, to repeat the targeted word, find the matching picture up in the 4th of July sky and to glue it on. 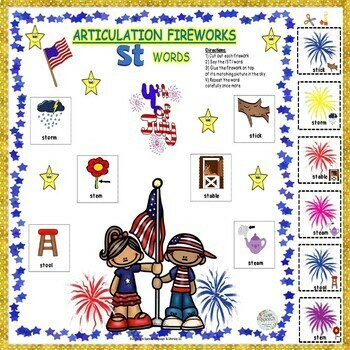 This a fun freebie for your students to enjoy for the 4th of July and if you love the sample, please know that you can pick up much more of what you see with our full unit named: 4th of July Quick Print Articulation: /F/, /R/, /AR/, /ER/, /OR/, /TH/, /L + open-ended sheets for filling any targeted sound! There's a large variety of black ink only worksheets that are fun to complete inside of it! Thank you so much for stopping by our Twin Speech, Language & Literacy LLC TPT shop today in order to pick up a freebie. We wish you all well and appreciate your support very much!